This immense emission nebula comprises hydrogen gas excited by UV light from nearby star Deneb. It bears a resemblance to continental North America and covers such an expanse of the sky that the Moon would fit into the “Gulf of Mexico”. 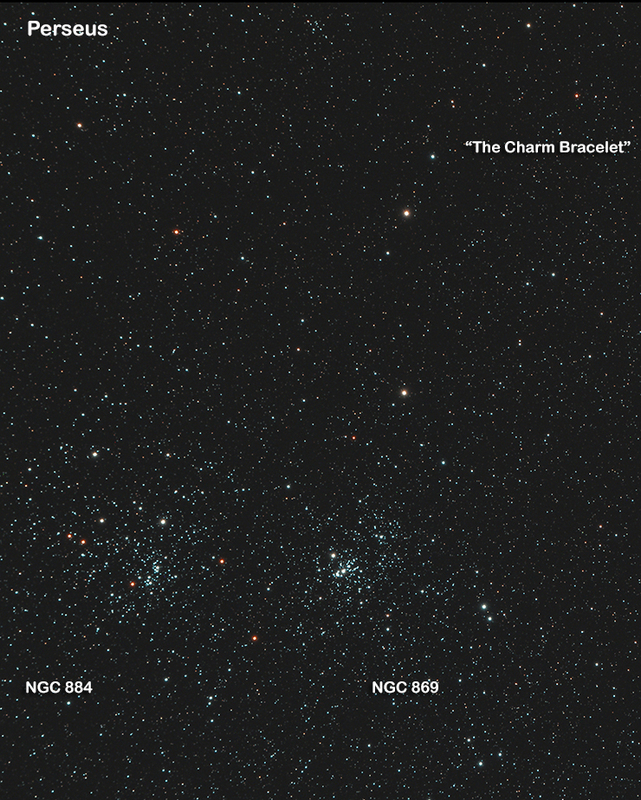 Open clusters Collinder 428 and NGC 6997 are marked. The denser area of HII towards the bottom is known as “the wall”. Just beside it is an obscuring patch of dust and cold gas, dark nebula LDN 935. This object is very difficult to see with a backyard scope in a light polluted town but photography really helps it stand out. Taken during 26th August session. 12 x 2 (24 min integration) min exposures. 480/80mm f6 refractor with 1.0x field flattener. Ioptron ZEQ25GT mount. Canon 60Da DSLR @ ISO 1600 with Astronomik CLS filter. Acquired with Backyard EOS and guided with Orion SSAG Autoguider/PHD software. Processed in Pixinsight 1.8 and Photoshop CC. 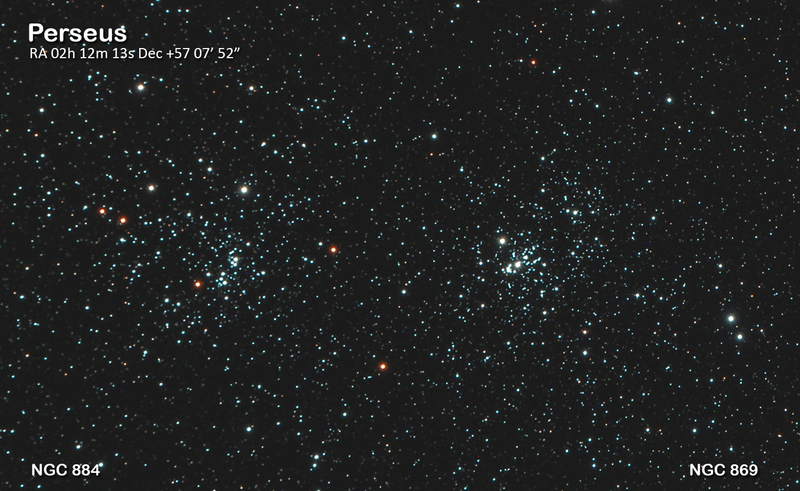 This pair of open clusters together make one of the classic targets to see in binoculars or a small telescope. Number 14 in the Caldwell catalog. Taken during session on 26th August 2014. 4 x 5 (20) minute exposures. 480/80mm refractor. Ioptron ZEQ25GT mount. Canon 60Da DSLR with Orion SSAG autoguider/PHD software. Processed in Pixinsight and Photoshop. Last night was crystal clear, so I was able to get 13 x 5 (65 total) minute exposures of open cluster M52 and emission nebula C11 (the Bubble nebula) in Cassiopeia. 480/80mm refractor. Ioptron ZEQ25GT mount. Canon 60Da DSLR with Orion SSAG autoguider/PHD software. Observing or imaging the Sun is DANGEROUS unless you use specialist equipment. NEVER risk your eyes. 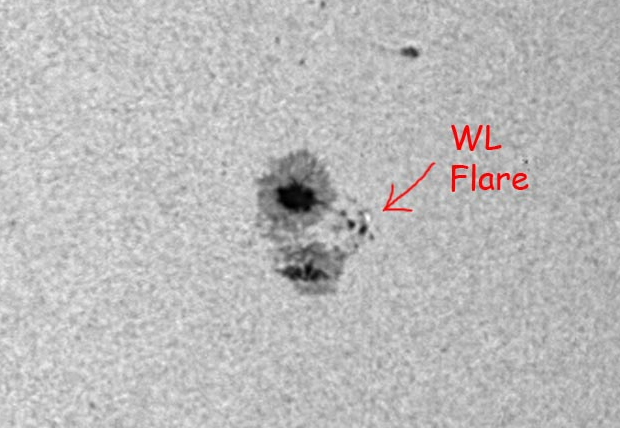 A fellow member of the “solarchat” forum, Chris Schur, posted an image of AR 2146 from yesterday showing a small white light flare. His post on the forum was around the same time as mine so I went back and reviewed my captured video from that period. I could find pretty much the same image in my data too! At this magnification, the small solar granulations (only 1000km across!) can be seen which represent convection cells radiating heat and light from the Sun’s photosphere. 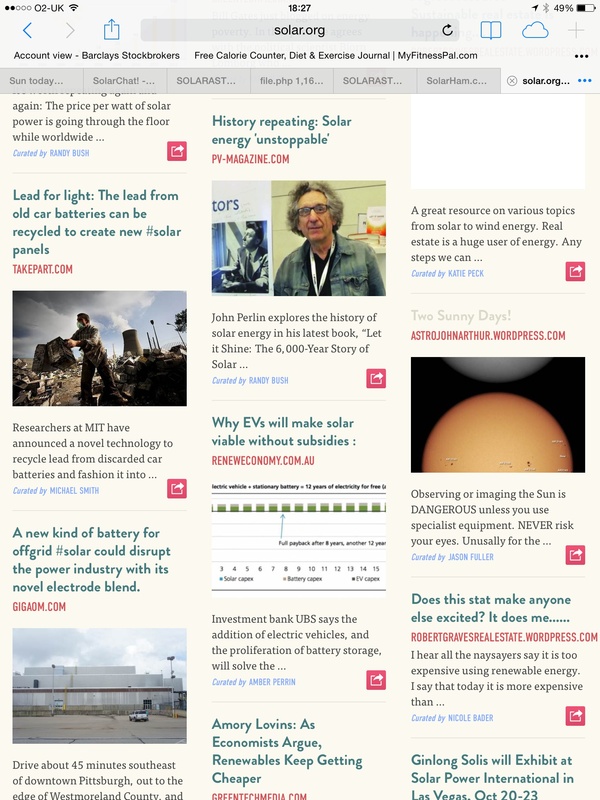 Click on the image to see it full size (just a bit larger). 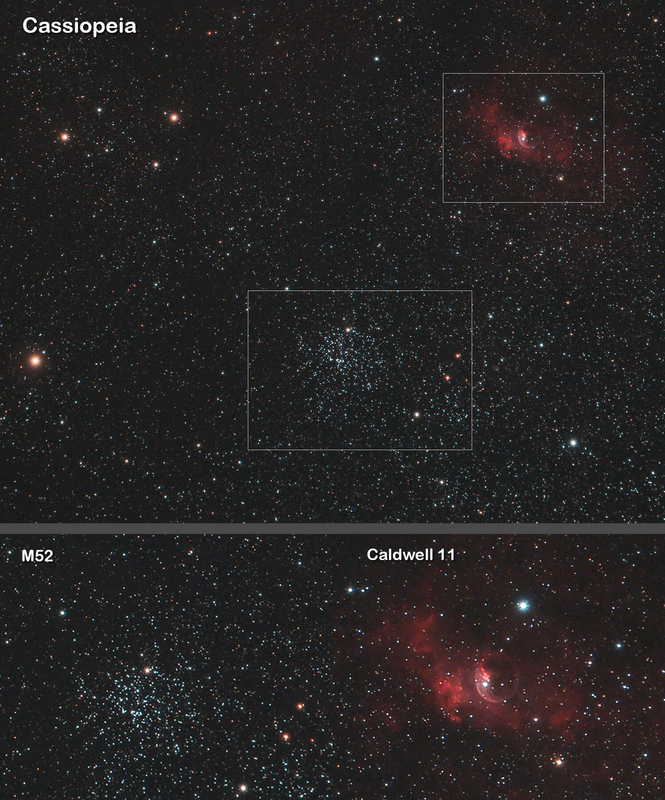 And then Chris’s first labelled image. Later on, he trained his big guns on it. Unusually for the Northwest, it was sunny today again! 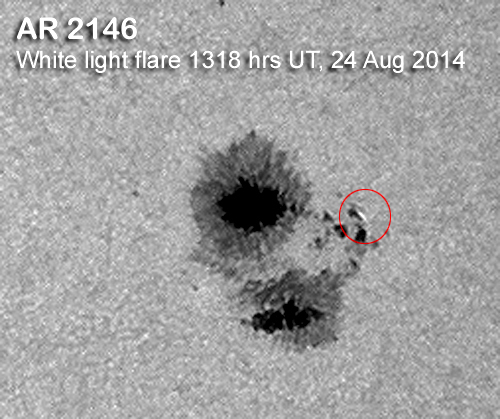 The Sun seems to be getting more active with some M-class flares recently. Took the opportunity to try to get close-ups of some active sunspots such as AR 2149. 480/80mm refractor. Baader Herschel wedge (Solar continuum and ND3.0 filter), Baader UV/IR cut filter. Skyris 273M CCD camera, Bresser 3.0x Barlow for closeup. 24th August; C5.5, C1.4, C1.7. 23rd August; C1.3, C3.5, C2.2, C2.9, C1.4. 22nd August; C2.6, C2.5, C4.1, C2.6, C8.5, C1.1, C4.6, M1.2. First time using a Baader Herschel wedge with my 480/80mm refractor. Images seem much sharper compared with using my Nexstar 8SE. Click to magnify image to full size. Skyris 273M CCD camera, TeleVue 2.5x Barlow for closeup.